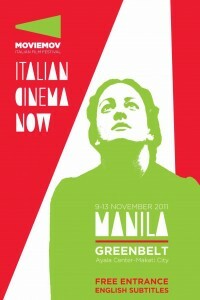 Presenting Moviemov: Italian Cinema Now at Greenbelt 3 from November 9-13, 2011. Moviemov is a travelling festival supported by the General Direction for Cinema of the Italian Ministry of Heritage and Culture. Its opening will be on November 9, 2011 at Greenbelt 5, Fashion Walk. Italian actors, directors and producers such as Dario Argento, Asia Argento, Lina Sastri, Ennio Fantastichini, Gianni Paolucci, Daniele Cipri, Alice Rohrwacher, Camilla Nesbitt, Claudio Cupellini, Carlo Macchitella, Franco Piersanti, and Luciano Sovena will join together with representatives of Asiatic Film Mediale, headed by Senator Goffredo Bettini, Italo Spinelli and a few local actors.